Top 10 most popular videos on YouTube. These ten videos have been watched millions of times. Charlie bit my finger and Bieber’s Baby song are among these. Have you ever wondered about which are the most watched videos on YouTube? I decided to investigate and dig out the top 10 of most viewed YouTube videos of all time. But do you think it was easy? Nay! YouTube hosts billions of videos. Finding the most popular ones is like finding needle in a haystack. But then a bit of research on Internet can give you answer to anything. That’s exactly what I did. And it worked! So, here is the list of most popular videos on the world’s largest video sharing website. 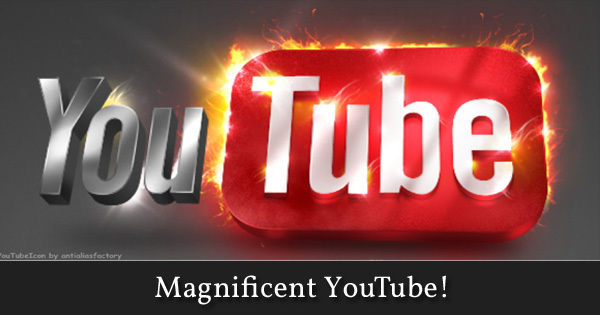 Do you know an interesting fact about YouTube? The first ever video on YouTube was uploaded by co-founder Jawed Karim on 23 April 2005 at 8:27PM. The video was titled Me at the Zoo and is still available on YouTube. This 18 second video has garnered 7,202,612 views so far. But this number of views is nothing if you compared it with the view counts of the top 10 YouTube videos. 1. Gangnam Style – by Psy (2,096,709,806 views). This video was first uploaded on Aug 15, 2012. This video was first uploaded on Feb 19, 2010. This video was first uploaded on Mar 3, 2011. This video was first uploaded on May 22, 2007. This video was first uploaded on Mar 8, 2011. This video was first uploaded on Jun 4, 2010. This video was first uploaded on Aug 5, 2010. This video was first uploaded on Apr 13, 2013. This video was first uploaded on Sep 9, 2013. This video was first uploaded on Sep 5, 2013. So these are the world’s most popular and most watched YouTube video. All of them are music videos; except for the funny Charlie bit my finger. Not only that Psy’s Gangnam Style has galloped way ahead of Justine Beiber’s Baby (which remained on top for long), the Korean singer has not just one, but two songs in the top 10 list. That’s really remarkable in the ever changing virtual world. I hope you’ll enjoy all of these videos. Stay tuned with TechWelkin!